The hard-line nationalist wing of the church has got out of control and there is nobody able or willing to stop it. Jolanta Urbańska, a local councillor in the southern Polish city of Częstochowa and leader of civic group the Association of the Democratic Republic of Poland has spent several years watching the rise of the far-right in her country. One of the elements she has documented is the close connections between the Catholic Church and groups such as the ONR, or National Radical Camp, and All Polish Youth, two of the most high-profile nationalist movements in Poland. During Soviet-backed Communist rule in Poland, the church was a symbol of intellectual freedom and served as a force of resistance against the oppressive regime. It was to priests that Poles would turn if they wanted to get hold of a banned book for instance. Now, far-right groups are seeking to exploit the historical connection between religion and nationalism, espousing common causes such as opposition to abortion and gay marriage. 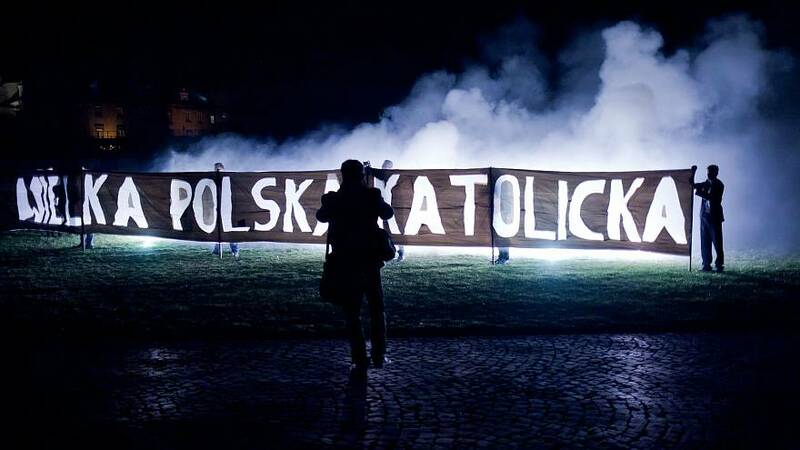 All Polish Youth operates under the slogan of "Great Catholic Poland" as it looks to widen its mainstream appeal. “There is pure nationalist message about Catholicism as the only true religion and the superiority of Poles over other nations which are thinly veiled with superficial humanitarian slogans. This is a perfect strategy to manipulate teenagers who seek their own identity and acceptance within a group”, said Urbańska, drawing on her experience of witnessing a recruitment meeting at All-Polish Youth in Częstochowa at the beginning of the year. The groups even take part in pilgrimages, most notably to Poland's best-known national shrine, the Jasna Góra Monastery where anti-Communist leader Lech Wałęsa’s Nobel Peace Prize medal is kept. It was during this event that Urbańska challenged the priests in attendance about their apparent acceptance of racist chants. Priest Tadeusz Isakowicz-Zaleski, who has jointly led mass at the pilgrimage on a number of occasions, defended the event as an opportunity to deliver a positive message to young people, especially male football fans. "This is an educational work. In my opinion, there should be more similar initiatives for educating teenagers," he told Euronews. He insisted that fascist symbols hung from the monastery walls were swiftly taken down and those in attendance were warned that racist behaviour would not be tolerated. Rafał Pankowski, co-founder of the anti-racist Never Again Association and professor at the Collegium Civitas said that nationalists benefit from the status of religion in Poland, where 94 percent of citizens say they belong to the church. “They feel that: “God is with us”. Even though many of them are not really followers of Christian teaching, they still feel empowered and emboldened by the authority that the Church enjoys in Polish society,” he told Euronews. Pankowski says that the church has lost the ability to resist the overtures of the far right, which were once kept in check by respect for Polish Pope Jean Paul II and powerful cardinal and former bishop of Warsaw Józef Glemp. “What we are witnessing is an implosion of authority. The hard-line nationalist wing of the church has got out of control and there is nobody able or willing to stop it. The hierarchy is compromised and has collapsed. Nowadays, an ordinary priest, Father Tadeusz Rydzyk, has more power than any of the Church officials such as bishops, and Pope Francis is being totally ignored,” Pankowski argues. For many, Rydzyk is the epitome not only of how the Church has leant legitimacy from its support from extreme nationalist policies, but also profited from the approach. The ultra-conservative priest owns an influential media empire encompassing the controversial Radio Maryja station, a television station called 'I Persist' (TV Trwam) and a daily newspaper. Rydzyk himself is known for commenting on current affairs and interviewing top politicians including President Andrzej Duda. His media outlets have been accused of airing anti-Semitic, homophobic and Islamophobic content. His channels offer extensive and highly positive coverage of the Jasna Góra pilgrimmage each year. He had not responded to Euronews’ request for comment at the time of publication. “The Church enjoys playing the role of a martyr facing an enemy or a dangerous situation. It is easier for the Church to sell straightforward stories presenting itself as a fortress besieged by external opponents such as liberals, the LGBT community or Muslims,” said Konrad Dulkowski, chairman of the Centre for Monitoring Racist and Xenophobic Behaviour. “For the Church, having a direct influence over the society translates into a possibility to demand more money from the government, which it also receives,” he added. Beyond his media interests, Father Rydzyk is involved in a range of other business, including geothermal energy projects, which have been awarded contracts and grants worth millions of euros since the populist Law and Justice Party came to power in late 2015. Some within the Catholic Church object to what they see as a lack of control over clergy espousing extreme views. “There is a small group of priests whose behaviour is not worthy of a priest and not worthy of Christianity. In my opinion, the Episcopate’s’ lack of punishment, or at least an explicit comment and an attempt to discipline such priest is a grave mistake. This should not be happening, but unfortunately it is,” Father Paweł Gużyński from the Dominican Order told Euronews. Mateusz Marzoch, leader of the All Polish Youth movement, describes his philosophy as "Christian nationalism: It is based on the principles of Catholic faith, but it also takes into account the good of the nation"
Others, however, see its work in a different light. Dulkowski, of the Centre for Monitoring Racist and Xenophobic Behaviour said that the groups serve to institutionalise hatred and violence towards immigrants and others who challenge traditional conservative values. “I know this because we have an insight into these groups. What happens there is incitement of racial hatred”. “In Poland, due to the rolling wave of hatred, we have reached the point when it is enough to point at someone and identify him or her as a new target – today we will attack those groups, tomorrow others,” Dulkowski concluded.